Kshitiji Nishkant Shrotri, charged with aggravated armed assault on a research fellow who he suspected to have taken away the woman he fancied, continued to be in a jail in Atlanta more than a week after the attack. Shrotri, 32, will be represented by a public defender at his first court appearance, Tracy Flanagan, public affairs officer, Fulton County Sheriff's Office, told rediff.com. If found guilty, Shrotri could face 10 years in prison and be deported to India. He had an opportunity to appear before a judge on February 5, the next day of the samurai sword attack, and ask to be released on bond, but refused to do so. "So he did not have any attorney assigned on that date," the public defender's office said. The sheriff's office would not say if he is taking medication for depression or is under suicide watch. Shrotri, who grew up in Pune, Maharashtra and studied in Purdue University before coming to Georgia Tech where the attack took place, reportedly had no visitors in jail. News reports and the authorities said he is a post-doctoral researcher at the University of Delaware but officials there would not say anything beyond that he has been on leave of absence for more than two months. Meanwhile, victim Samer Tawfik, 39, a post-doctoral research fellow in the School of Aerospace Engineering at Georgia Tech -- from where Shrotri also received his PhD in aerospace engineering two years ago -- is still in hospital. But he has been talking to the authorities and local media. 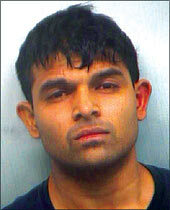 Authorities said Shrotri wrote about his passion for martial arts in his university application. The attack, in which Shrotri used a samurai sword, took place around 1.20 pm. He was overpowered by a group of campus police officers who happened to pass by the attack site. Tawfik told the Atlanta Journal Constitution that Shrotri suddenly confronted him and declared, "I have to kill you." Though he recognised Shrotri from a confrontation over the young woman -- who has not been named by the authorities -- six months ago, he did not expect the threat. Startled, he asked Shrotri, "Why?" Shrotri repeated his earlier declaration and began stabbing him in the leg and close to his heart. "He was about to slaughter me," Tawfik told the local media. "And, of course, you cannot reason with a killer." If the campus police had not witnessed the attack or someone else had not intervened, he might have died. Several students at the university said that every time a foreigner goes on a rampage or attacks a student or professor, anti-immigrant bloggers go berserk and demand the reduction in the number of foreign students allowed into America each year. This happened about five years ago when Biswanath Halder went on a seven-hour shooting rampage, killing several students, at Case Western Reserve University where he had sought an MBA degree. And then there was the rampage at Virginia Tech. Authorities confirmed that Shrotri had left Atlanta for Delaware in September after flying into a rage, seeing the woman he fancied dance alongside Tawfik at a campus social organiaed by the Turkish Students Organisation. The AJC said Shrotri yelled at Tawfik in Turkish and English. But others believe that he yelled in English and Hindi. "These are the languages that come naturally to him," said one student who requested anonymity. "Tawfik is reportedly from Egypt and he may not know Turkish." When the campus police took Shrotri away from the scene, he told them that he had romantic feelings for the woman and he had yelled at his friends for not keeping Tawfik away from her. The woman told the authorities that she had exchanged a few e-mails with Shrotri but there wasn't a hint of romance in them. She thought of seeking a restraint order against Shrotri but changed her mind, fearing it could aggravate the situation. Authorities also said that Shrotri agreed to stay away from her and was told he would be arrested if he harassed her. Interviewed by the Atlanta media in the hospital, Tawfik said he wonders what made Shrotri think that he was involved with the young woman. Even at the September event, he had not subdued Shrotri and had even refused to be a part of any complaint. Look, who's back in business?